The Royal College of Music has been holding the RCM International Festival of Viols and for the grand finale in the college's Amaryllis Fleming Concert Hall on Tuesday 27 November 2018, 10 young players came together to perform a programme of fantasies and consort works by Byrd, Purcell, Ferrabosco, Parsons, Gibbons, and Lawes. The players were from the RCM and from the Salzburg Mozarteum, nine viol players in all coming together in a variety of configurations, Isabel Esain, Yusuf Lahham, Luke Challinor, Salome Gasselin, Hannah Kilian, Corinna Metz, Vittorio Ghielmi, Christoph Urbanetz, and Sarah Small, with Claire Williams on organ for the final two works by William Lawes. We heard works for a variety of combinations of instruments, from two bass viols and organ, through four-part and six-part to seven-part works, including a remarkable work by Ferrabosco for six bass viols. We started with a Pavan & Galliard by William Byrd for a consort of six viols. 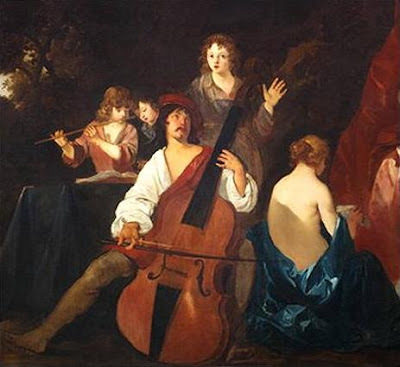 The sound world is very different from the more modern string sound, and particularly when heard live you notice the extreme feeling of texture that the viols bring with a remarkable unity of timbre from top to bottom. The consort made a light but meaty sound, enlivening the texture with rhythmic motifs. Next came two Fantasies in Four Parts by Henry Purcell, with the players giving the music a really haunted quality, playing daringly quietly at times. Ferrabosco's Di sei bassi for six bass viols created a really rich and sonorous sound. Parsons two In Nomines in Seven Parts used the intertwining parts to create sound-world which was remarkably even. Orlando Gibbons' Fantasy in Four Parts 'to the great double bass' No. 1 and No. 2 included the double bass viol but rather than exploring the darkly sonorous, Gibbons gave us remarkably perky tunes and lively rhythms. In all this music the sense of counterpoint was foremost, with the feeling of a consort of equal parts weaving in and out of each other. William Lawes Divisions for Two bass viols brought a real change of style, as the two bass viols vied with each other to develop rather sedate beginnings into some very busy fingerwork, all supported by Claire Williams on the organ. Finally we heard Lawes' Consort set in Six Parts in C minor, a multi-part work for a consort of six viols with organ. This was the longest and perhaps most developed work in the programme and made a fine end, though I thought it a shame that a work could not be found for all the players, perhaps one should have been commissioned. The viol festival was dedicated to the memory of a long time supporter of the college who had donated four 17th century English viols to the college's collection, viols which featured in the concert finale of the festival.